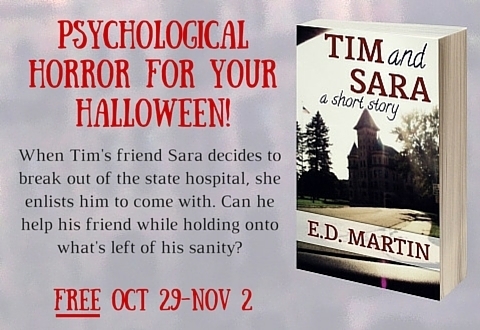 FREE psychological horror story to celebrate Halloween! The victim of debilitating flashbacks, Tim is content to spend the rest of his life at Kirkbride, a state mental hospital. But his friend and fellow resident Sara is concerned that she has to save her soul before it’s too late, and so she devises a plan to break them out of the hospital. Can Tim help his friend while holding onto what’s left of his sanity? FREE October 29th – November 2nd. One of my goals for this year is to improve my marketing. In addition to running various ads, I’m also trying to fit in more appearances – book signings, author fairs, etc. This Saturday, I’ll be at the Iowa City Book Fair, part of their annual book festival, running the table for my publisher, Evolved Publishing. Stop by the downtown pedestrian mall from 10-5 to say hi, pick up a copy of The Lone Wolf and works by other EP authors, and get lots of free swag. If you’d like to get even more insight and prizes, consider joining the Evolved Publishing Street Team. In return for spreading the word about EP, you get sneak peaks on upcoming novels, special giveaways, and the ear of your favorite writers. Win-win all around! 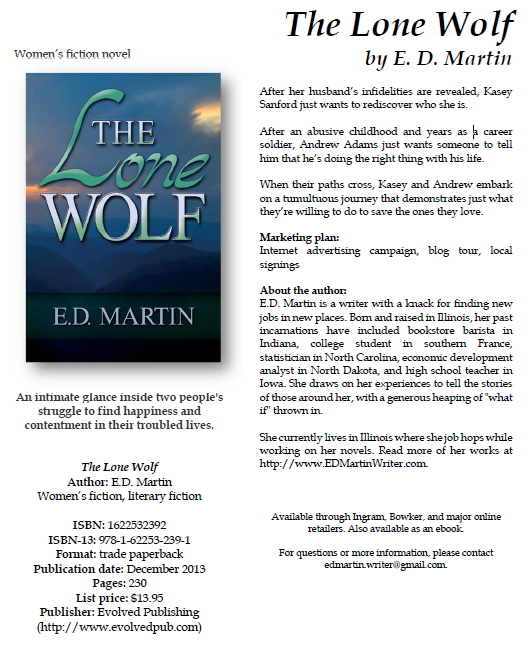 Yesterday was the official launch day of my women’s fiction novel, The Lone Wolf. A HUGE thank you to everyone who’s helped me along the way; I definitely couldn’t have gotten this far by myself. The book is available, in print or as an ebook, through Amazon, Barnes and Noble, and Smashwords. Or win a copy by entering my giveaway! And thanks again for all your support! My novel, The Lone Wolf, launches Monday! And to celebrate, I’m giving away a couple signed paperback copies and some ebooks. I’m gearing up for the launch of my first novel, The Lone Wolf, in just a couple weeks. I’ve already made a book sell sheet, which I gave area booksellers when asking them to sell my book. It had all the information they needed to order my novel from their supplier. I’m also planning some giveaways: a Rafflecopter contest here on my blog, a day to interact with my publisher’s street team on Facebook, something at this week’s NaNo write-in, and who knows what else. Want one? Add The Lone Wolf on Goodreads, and then use the contact link above to send me your address and a link to your bookshelf. And make sure you keep checking back, because there’ll be a lot going on between now and launch day on December 2nd! Earlier this month, Indies Unlimited had a great post on book sell sheets, which are basically flyers with all your book’s relevant info on them: author name and contact info, ISBN and price, description and genre, etc. My first novel, The Lone Wolf, is launching in about a month. It’ll be available through Amazon, Barnes and Noble, Smashwords, and my publisher’s website, but I want it available locally too – and a lot of bookstores are willing to sell local authors’ books. So I made a sell sheet. And I’m really glad I did. It was great to walk into a bookstore and hand the order person all the information. They had the ISBN right in front of them to enter into the computer, and any questions they had were answered by the info on the sheet. It paid off, too – Barnes and Noble agreed to stock my novel, BAM was a maybe (not a no! ), a mall chain said they’d stock it if they can find space, and another said they’d most likely take it on consignment (but the guy I need to talk to is on vacation). And the library is getting a couple copies for circulation! If you have a book you’d like to get into stores, I highly recommend you make a sell sheet too. 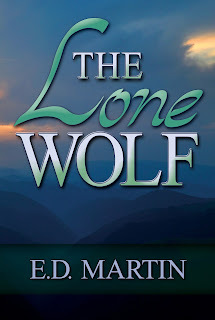 I’m going to be switching gears here, from A Handful of Wishes, my WIP about a boy and his genie, to my soon-to-be-released women’s fiction novel, The Lone Wolf, out December 2nd from Evolved Publishing. In this chunk, Kasey has just arrived home from running some errands. As I stepped onto our front porch, an envelope tucked in the front storm door caught my eye—no return address, no postage, just Mrs. Sanford scrawled in messy feminine handwriting. I picked it up, opened it, and pulled out the contents: a letter, wrapped around several photographs. I smiled at the quaintness; who printed out pictures anymore when they were just as easy to email? I set the letter aside and studied the photos. Their low-quality fuzziness indicated they’d been taken with a webcam, but I could still clearly discern two people intimately engaged. As I focused on the images, my smile faded. One figure was David; although his face wasn’t visible in the photos, after almost ten years together I’d have recognized his stocky frame anywhere. The other figure, the female, was not me. Last week, author/blogger J.A. Konrath issued a challenge – write and publish an ebook in 8 hours. About 140 people responded, and he published a link to everyone’s works. Some were serious, others absurd. I decided to try it. I wrote a story under a pen name (no, I won’t tell you which book is mine). It went live on Friday, set for free for the next five days through Amazon’s Kindle Select program. On the first day, before Konrath had written his post and with no advertising or acknowledgment, it had 80 downloads. By last night, the last day of the promotion, that number was close to 400, and at one point it was in the top 2500 for Kindle downloads. Not bad for something that took about eight hours to write, format, and publish. But will it translate to sales? I’m thinking of turning it into a (super secret) series; if I get the next one done soon enough, will people pay for it after reading the first one? Can I build momentum for these books with no additional advertising on my part? Recently I’ve heard quite a few writers concerned with genre-hopping. Many agents and publishers discourage it; if you want to write different stories, you write under different pen names. It keeps your fans compartmentalized – for example, the romance fans don’t have to read sci-fi they may dislike – but it’s harder to build that elusive platform, as you’re essentially building two (or more, depending on how many pen names you go with). So, can you be successful as a genre-hopper? My publisher, Evolved Publishing, has no problem with it (they’re leniently awesome about a lot of other stuff too). And in the past few months, I’ve come across a really good example: the band Imagine Dragons. At first, I wasn’t big on them. “It’s Time” is a blatent rip-off of Sigur Rós’s “Inní Mér Syngur Vitleysingur,” a song I happen to love but most people have probably never heard. “It’s Time” is fun, hopeful, light. It’s played on most Top 40 radio stations. And then I heard “Radioactive,” which is not really fun or hopeful or light. And it’s played almost exclusively on rock stations. Intrigued, I got their album, Night Visions (and I highly recommend you do too). It’s a mix of light pop songs, dark rock songs, and some Caribbean steel drums that conjure up memories of the lobster from The Little Mermaid. And the mix is working, because their debut album has gone platinum in the US (1 million+ albums sold). I think part of their success is their marketing approach: target pop people for the pop songs and rock people for the rock songs, each of whom will buy the whole album and probably enjoy it. The lesson for writers, I guess, is that you need to cast a wide net. 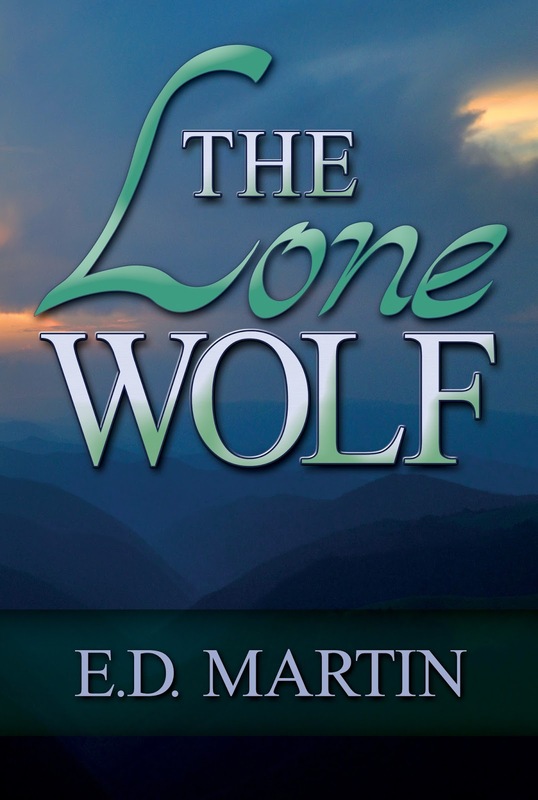 My novel, The Lone Wolf, is women’s fiction and I’ll market it towards women’s fiction writers, but chances are they’ll enjoy my other stories when they read them (or at least buy them). Readers who enjoy my darker short stories will buy the novel and appreciate some of the darker characters. I hope. What’s your take on genre-hopping and marketing: good or bad? Why?